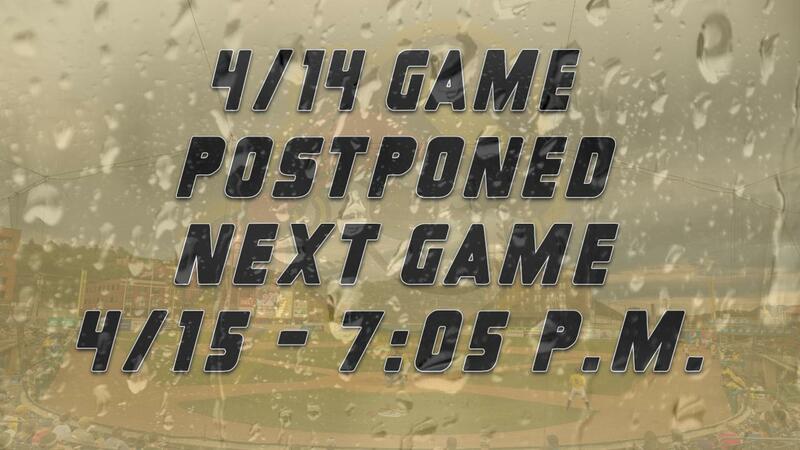 West Virginia's series finale with Augusta has been postponed due to inclement weather. It will made up as part of a May 9 doubleheader beginning at 6:05 p.m.
CHARLESTON, W.Va. (April 14, 2019) - Due to inclement weather, today's West Virginia Power game against the Augusta GreenJackets has been postponed. The two teams will make up the contest as part of a doubleheader during Augusta's next trip to West Virginia in the first half. The twin bill will be played Thursday, May 9, with first pitch of game beginning at 6:05 p.m. Gates will open at 5:30 p.m.
Tickets for Sunday's contest can be redeemed for any future West Virginia Power game at the Power Box Office, located on the first base side at 601 Morris Street. Fans can exchange their tickets for ones of equal value (i.e. Box seat for Box seat; General Admission for General Admission). West Virginia continues its opening homestand Monday evening with the first game of a three-game series against the Lakewood Blue Claws. First pitch is set for 7:05 p.m. from Appalachian Power Park. RHP Logan Gilbert (1-0, 0.00 ERA) will take the hill for the Power, while the BlueClaws counter with righty Jack Perkins (0-1, 4.05 ERA). Pregame coverage begins at 6:45 p.m. on The Jock 1300 and 1340 AM, online at www.wvpower.com and via the TuneIn Radio App and MiLB First Pitch App. Monday is the first Family Buck Night of the season, where all fans can purchase $3.00 box seats or $1.00 general admission tickets, as well as $1.00 hot dogs, popcorn and 12-ounce Pepsi products. Also, we will be hosting an Easter Egg Hunt with the Charleston Police Department. For tickets and more information on the opening homestand, call the Power at 304-344-2287 or visit wvpower.com.